There is a place called Castle Restaurant on Allegany Road in Olean, New York. I was reading through your NY castles and saw the Castle Restaurant in Olean, NY. It is actually located in the town of Allegany right on the border to the town of Olean. I went to college across the street from this restaurant at St. Bonaventure University, and we had many formals at the castle. It is a small restaurant with odd operation hours and has a large dining room that is commonly used for weddings or formal dances. The building as a whole is pretty beat up and not very popular as it's been shut down many times over the years. There is a motel behind it called the Castle Inn which is only one of two motels in the town of Olean. I worked at the Castle in Olean, NY until I moved to Florida 4 years ago. It has since shut down (first the restaurant, while I was still there and recently the inn). It was started by the Butchellos about 55 years ago and it began as a gas station! The rooms are all named after royal objects e.g. the Crown Room, the Ball Room, the Throne Room, etc. It is beautiful and everyone who grew up in the area has a zillion memories of banquets, weddings and parties there. I worked at the former Castle Restaurant as a banquet waiter for several months in 1983. This restaurant had, on the surfaces, all of the trappings of a luxurious restaurant, hosting conferences and formal events of all kinds. I do not know its seating capacity, but this restaurant could easily accommodate several hundred revelers at one time! It was a fun place to work, thanks to the perhaps noblesse oblige (let's not call it laxness) of the "royalty" there. The entrance to The Castle was its best feature: the echo of one's footsteps brought to life the convincing looking round foyer with its stone floor and ancient decor, including a suit of armor that did not look like a copy. Although the foyer was dimly lit, the passages leading from the foyer were more shadowy, adding to the effect of venturing deep within something solid and very old. The dining rooms, perhaps eleven in all, featured authentic touches like leaded glass windows, hardwood custom paneling, and restrained decor (no Las Vegas styling!). 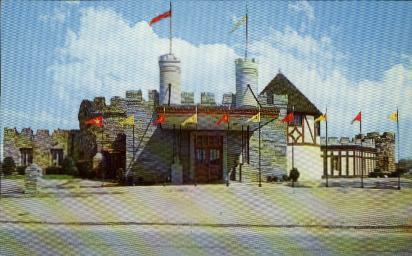 THE CASTLE RESTAURANT IN OLEAN, NY WAS DESTROYED SEVERAL YEARS AGO. IT IS A VERY SAD STORY. (THIS IS MY "OLD STOMPING GROUNDS") I USED TO WORK FOR THE BUCHELLO FAMILY. THE RESTAURANT DID, INDEED, BEGIN AS AN OLD GAS STATION. WHEN THE ORIGINAL OWNER WAS STILL ALIVE, THE BUSINESS WAS THRIVING. BUTCH DIED IN THE 1970'S AND HIS TWO SONS, GERRY AND DANNY TOOK OVER. THE TWO OF THEM DID QUITE WELL. HOWEVER, TRAGEDY STRUCK. DANNY DIED OF A HEART ATTACK IN 1984 AND GERRY DIED OF A HEART ATTACK ONE YEAR LATER. THE BUSINESS FELL INTO THE HANDS OF THEIR CHILDREN. THEY FAILED. THE BUSINESS SHUT DOWN, WAS EVENTUALLY SOLD AND TORN DOWN. AS FAR AS I KNOW, BOTH THE CASTLE INN AND THE CASTLE RESTAURANT ARE GONE. IT IS A TERRIBLE SHAME. I THINK THE FAMILY STILL HAS A RESTAURANT CALLED THE L'ALCOVE, WHICH IS LOCATED ON NORTH UNION STREET IN DOWNTOWN OLEAN, NY. I live in Allegany, NY and I am writing to tell you the last email you have posted on the Castle Restaurant formally owned by the Butchello family is incorrect. Both the restaurant and the inn are still standing. They are located on West State Road in Allegany, NY, also known as route 417. Yes the family fell behind in both their taxes and utility bills until it was completely shut down a few years ago. At that time the Catholic church, St. Bonaventure University, which ownes adjoining property bought the properties for an undisclosed price...rumors are it was in excess of one million dollars. Since that time the college has done nothing with the property and it continues to deteriorate and have again been put up for sale. The other restaurant the family owned..the Alcove located on North Union Street also closed and is under new management called Xangoes. The other thing The Castle was noted for was their sauces, which were marketed under the name of Loretto Foods. This has also closed. It is hoped that at some point the restaurant will be restored to its previous splendor. Regarding the status of the former Castle Restaurant and Inn in Olean, NY -- here is the latest information. It is to be torn down to make way for a new commercial development. Well, after years of vacancy, they brought it down!! Thanks to Phil Bilzor for sending in the photo.